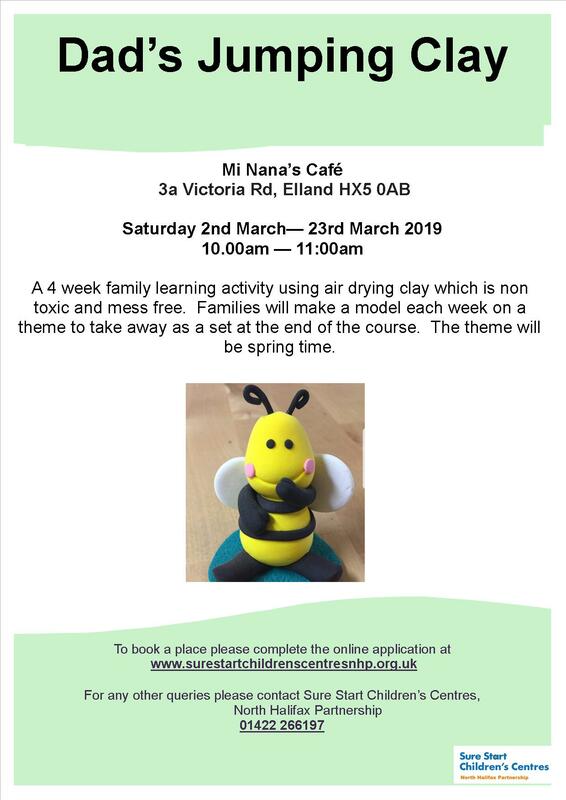 There will be a family learning course at Mi Nana’s Cafe, 3a Victoria Road, Elland HX5 0AB over 4 weeks starting Saturday 2 March, 10:00am-11:00am. The activity includes using air-drying clay which is non-toxic and mess free. Families will make a model each week on a theme of springtime and can be taken away as a set at the end of the course. There are a limited number of places available to book your place on the Sure Start Children’s Centres website. For further information call Sure Start Children’s Centre, North Halifax Partnership on 01422 266197. This entry was posted in Events, Mar, Sure Start, Young People and tagged NHP Sure Start Children's Centres.